Free Plastic Moving Boxes? !! !Yes !!!! We leave the Free Plastic Moving Boxes for 1 Week by you at home or office to be filled with your stuff For Free ! Our boxes are made with sturdy, recyclable plastic. They have attached lids that fold neatly into place for easy stacking. Bins are large (24”x20”x12” ) and hold 2.4 cubic ft of space. For your more valuable items, the boxes can be secured with ties or other secure measures. For office moves for sensitive documents, you can secure them and have chain of custody protocols with signed secure ties. WHICH AREA WE ARE COVERING? We are cover those cities like Chilliwack, Mission, Surrey, Port Coquitlam, Abbotsford, Maple Ridge, Pitt Meadows, Coquitlam, Port Moody, Burnaby for using free plastic boxes.Also, We cover Port Coquitlam, North Vacouver, Vancouver, UBC area. Using this offer (Free Plastic Moving Boxes) which is absolutely free of charge is the Quickest, Least Expensive and Easiest Way to Move Your Home or Office. The quality of the boxes are industrial strength construction which supports large stack and heavy weight. additionally Ergonomic designed handles provide for safer, easier lifting and carrying. 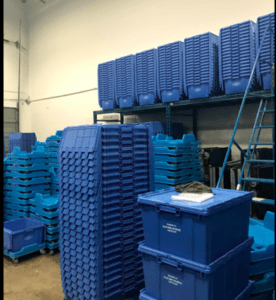 We work continually to satisfy our customers and try hard to introduce new services like Free Plastic Moving Boxes periodically to improve the quality of the services that can be offered to you. We offer different approaches to our customers and allow them to have a frictionless Moving. Give Secure Moving a call for more advice at 1-6047243432 today to see if we can help make your move easier or request a Free Plastic Moving Boxes online.